Sir Charles Robert Saumarez Smith (born 28 May 1954) is a British art historian. He was educated at Marlborough and King’s College, Cambridge, where he was a scholar and got a double first in history and history of art. After graduating, he spent a year at Harvard University as a Henry Fellow studying at the Fogg Art Museum and then returned to the Warburg Institute as a postgraduate student. 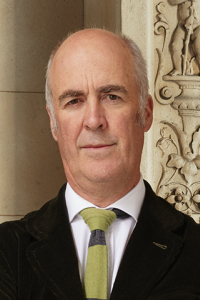 In 2007, Sir Charles was appointed Secretary and Chief Executive of the Royal Academy of Arts, where he has concentrated on the renovation of the Keeper’s House and the development of plans for Burlington Gardens in the lead-up to the RA’s 250thanniversary in 2018, including a major fund-raising campaign and successful application to the Heritage Lottery Fund. He is a Professor of Cultural History at Queen Mary, University of London and a Trustee of the Garden Museum. In 2008, Charles was awarded a CBE and was knighted in 2018 for his service to the arts. He will be joining Blain Southern in January 2019 as Senior Director.